Chairs! started the whole thing. Like many organic chemistry instructors and professors, I teach the conformational isomers concept, Newman projections and cyclohexane chairs, in the first few weeks of organic chemistry. I also tell my students that this idea is truly esoteric. They are now part of the select ‘brethren’ for whom rotation around carbon-carbon single bonds is valued. Yes, esoteric, but also yes, important. This is an introduction to learning about projections and taking three-dimensional models and flattening them into two-dimensions. They need to be able to draw and, more importantly, see and understand these drawings. This skill is not emphasized in previous chemistry classes, so for them this visual-spatial concept is very difficult. It will also come back to haunt students later, such as with elimination reactions. So, how could I possibly make a game of this rather obscure chemistry concept?! I have been playing ‘The Chair Game’ for years at my white board. I draw two big ‘chairs’ on the board, and point to the carbon vertices and say either up/down or axial/equatorial, and the class has to respond, together. It’s fun, different, a bit silly, and gets students involved. From there, I decided to devise a bunch of other game concepts and presented these ideas to a local consulting firm that helps tech start-ups get off the ground. My good friend, Carl, is a partner in this very appropriately named firm called, Brilliant Chemistry, or BC. They helped me build the game mechanics and design of the most expansive idea, based on mechanisms. That game is truly breath-taking and beautiful, but, oh, SO expensive to code and develop. So, I kept coming back to the Chair game. I could afford Chairs. I had another fabulous student, also now at MIT, do the preliminary coding for a touch screen version of Chairs during his senior project. I paid BC to help him with this project. But there is only so much a high school senior can accomplish during a short 5-week internship project. 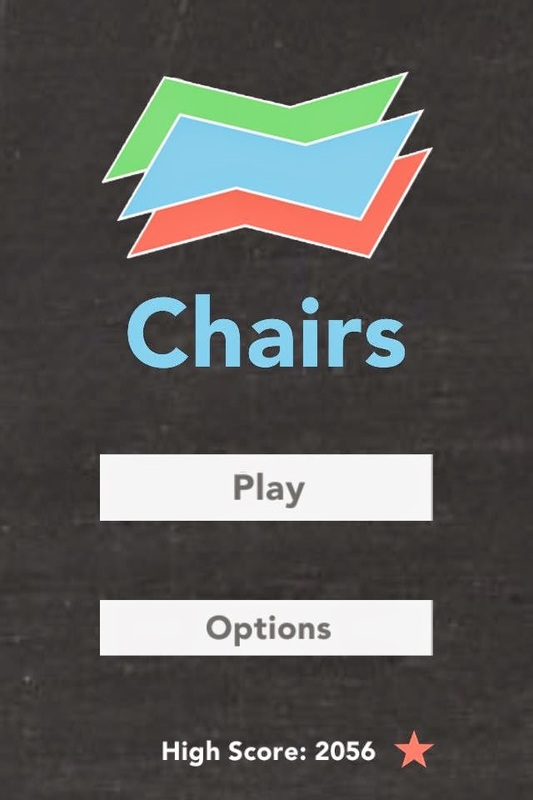 My co-founder, Joe, and I have put together this Chair game over the last few months. He’s the game guy and I am the chemistry lady. We work great together. I teach him chemistry, he teaches me game design. I knew there was something special when I could not stop playing the beta-version of our game in August during vacation. I kept telling my husband, it was all part of testing and development. (Yeah, yeah.) Once we added the cool bluesy music track, it got even more addictive. So now we have great game with 13 levels. (Joe just told me about level 13, I thought it stopped at 12.) My top score after hours of play-time is 150. I have cracked level 10, but no further. I freak out a bit when I get beyond 120 points and start making mistakes. I did a classroom trial with my 40 or so organic chemistry students. All of them had a traditional lesson during which I introduced the cyclohexane concept. They also had access to my set of videos. They were divided them into two sub-groups—those who could play the game before the next class and those that could not. I gave them all a four-point quiz about cyclohexane substituents as class started. The results from this little study are striking. Students were FAR more likely to earn 3 or 4 out of 4 if they had played the game, even for as little as 5 minutes. The students then played Chairs! throughout the class period and I gave them a different four-point quiz. Over 90% of the students of them improved on their initial scores—excluding, of course, those with 4/4 on the first quiz. Yes, I was very pleased with learning outcomes. It’s difficult not to improve understanding, when you can practice over and over (and over) by playing a game. That’s one of the main ideas of game-based learning. The trick, of course, is to make a game that students will actually play. It was amazing to see how much they liked the Chairs! game. I received an email at 11pm that night from Cathy: “I need to stop playing this game! I tried to break 1000, but I messed up.” (She earned 955.) And a text from Jackie the next day, saying she would be late for cross country practice with a screen shot with a score of 2056(!). Even if students were scoring in the ‘normal’ range of 30 – 100, they were having fun solving the puzzles. We are hoping to get our game out to everyone as soon as development and Apple will allow. An Android version is also in the works. My students have devised all sorts of essential features and in-app purchases to make the game even better. I have written them all down and sent them to Joe. Right now, the goal is a simple, free game with a short non-interactive tutorial section. Bells and whistles to follow.